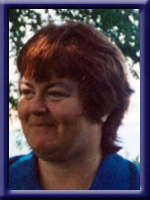 Lowe- Laura Lee, 50, of Liverpool, passed away suddenly at home on Wednesday March 12th, 2014. Born in Liverpool, she was a daughter of Mervin MacNutt of Milton and the late Donna (Baker) MacNutt. Laura will be fondly remembered by her family and friends for her love of cats and music, especially country. She is survived by her husband Mitchell “Mickey”, son Ryan (Maria Guest) of New Germany, grandchildren Tristan, Ashton and Aaliyah, her brother Jackie (Patsy) of Liverpool. To all the Family we would like to send our Deepest Sympathy R.I.P Laura-Lee you are home at last. Micky and Ryan I am so sorry to hear about Laura Lee. We went to school together and oh what fun we use to have. Ryan I am just a phone call away if you need anything…. To Uncle Mervin and all the family so sorry to hear of Laura’s passing . Hold onto all your memories and the love that you shared and she will always be with you . Mickey , Ryan and all of Laura’s family, may Laura be at peace now. Remember the good times, she will always be close to your hearts. Thinking of you all at this most difficult time. Our thoughts and prayers are with you. I am so sorry to hear of Laura Lee’s passing. This was a big shock to me. We were best Friends growing up and did everything together. I remember so many good times that we had. As we grew up we went seperate ways with Our lives and lost touch. But often thought about her. We would see one another once in awhile at the Grocery Store and have a chat. My thought and prayers are with her Family. So sorry to hear of Laura Lee passing. I will always remember LauraLee for her kindness & soft smile. My prayer are with you all. my thoughts and prays are with all her family. so sorry to hear about their loss. Mickey Ryan and family we was sorry to hear of Laura-lee passing our thoughts and prayers are with u at this sad and difficult time ..
Ryan; We were sorry to hear about your mother. Our thoughts and our prayers are with you and your family. Our thoughts are with Laura’s family at this sad time. .Angels be with you…. Please accept our most sincere condolences on the passing of Laura Lee. She was always there when a family member became ill. She helped take care of several of her relatives including her mum. Even though she was not well herself she always had a smile on her face and a joke to tell. She will be greatly missed by not only her family, but friends as well. I am so very sorry and shocked to hear of LauraLee’s passing.I have known her all my life and whenever i saw her she always had that smile on her face and a hello.Cherish your memories cause the are the one thing nobody can take away from you.My thoughts and prayers are with you all.R.I.P. LauraLee. She’s with her mother, my mother and our grandmother–just like the old days, when we’d all be in Nan’s kitchen together. I know they’re there, joking and laughing just like we always did. Those are the best memories, and they will live on forever. We are very sorry for your loss. Laura is now with her Mother and all her other loved ones. She is now free from her pain and she will now be your own special Angel. Dear Mick ,Ryan,Merv and Jackie .No words can express the sadness we felt when we learned of Laura’s passing.We lived next door to the family for quite a few years and she was always a very pleasant person,she spent a lot of time sitting on my steps with me and we would have a good laugh over everything and nothing,she will be greatly missed ,may she rest in peace .Please accept our sincere condolences ..
Dear,Mickey,Ryan,Jackie,Mervin,and all the rest of Laura Lee’s family, I was stunned and shocked at the news of her loss. I met Laura Lee a very long time ago- our parents were best friends,and we spent lots of fun times together- I even babysat Laura Lee and Jackie a few times! She was a sweet child,polite,a little shy and she loved to laugh! We met up again, years later, she was so happy to be a mom- and Mickey- you always had her laughing! She loved her family so much. Her gentle,sweet soul will forever be missed! Mickey, Ryan & Maria & grand children; so sorry to hear of Laura Lee’s passing, our thoughts and prayers are with you through this sad and difficult time. May you take comfort in your memories. Thinking of you.I realize at this point words are not much comfort but down the road it may help you to know people were thinking of you.Laura had the best of caregivers,(YOU).You always looked out for her and made sure she had what was needed.That’s a great thing to have.You’ve earned a pair of angel wings. Our deepest sympathy to Laura Lee’s family, I have known Laura Lee all of her life. This is such a shock too read tonight she was way to young to die. Our thoughts and prayers to all of the family. Mervin, Mickey, Jackie, Ryan and the rest of the family. I was so sad to hear of Laura Lee’s passing, her memories are always close to heart, she always had a special smile and laugh that made you smile. Thinking of you all at this most difficult time. I’m so sorry to hear of Laura Lee’s passing. We played together as children. Many fond memories of her. My thoughts and prayers are with you. We are so sorry for your loss. Thoughts and prayers are sent to your family at such a sad and difficult time.